RB C.J. Anderson vs. LB Jon Bostic – Anderson has been busy lately and seems to be pulling away from the three-man committee in Denver. He’s logged 37 carries over the past two games compared to just 11 and three for Devontae Booker and Jamaal Charles, respectively. 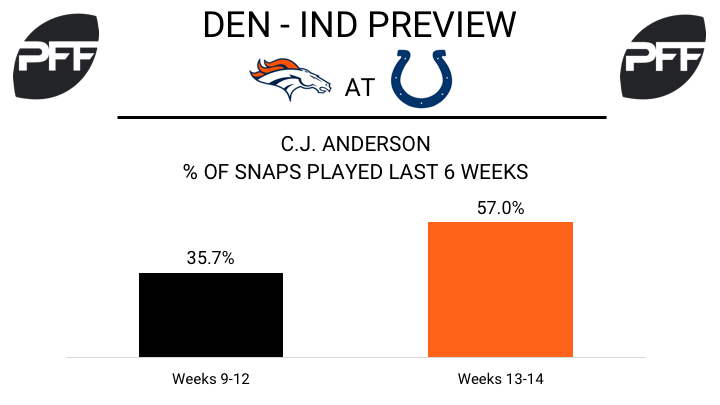 Anderson has been the most active among Broncos running backs in the passing game as well, averaging 2.62 yards per route run on 26 total snaps in route the past two weeks. Bostic has been very solid against the run this year, earning a run-defense grade of 84.6, 15th-best among linebackers. After starting the year with below average grades in 6-of-7 games, Bostic now has above average grades in six straight games. WR Demaryius Thomas vs. CB Quincy Wilson – When Thomas (overall grade of 74.9) lines up against Wilson this week (overall grade of 76.3), Wilson will look to ride his hot streak over the past two weeks against one of the NFL’s most polarizing receivers. Over the last two games, Wilson has allowed a passer rating when targeted of 57.9 and a 40.0 completion percentage. Broncos quarterbacks have just a 66.1 passer rating when targeting Thomas this year, including a league-high seven interceptions. 29.2 percent of QB Trevor Siemian’s pass attempts the past two games have gone to Thomas (21 targets), so he should continue to have plenty of opportunities this week against Wilson. WR Emmanuel Sanders vs. CB Kenny Moore II – Opposite of the Wilson-Thomas clash, Sanders has a plus matchup against Moore, whose coverage grade of 43.0 would rank 107th among cornerbacks if he’d played enough snaps to qualify for a rank. Moore has been thrown at 15 times this year and has allowed 11 receptions for 211 yards, good for a whopping 19.2 yards per reception average. Sanders’ overall grade of 69.9 ranks 63rd of 116 wide receivers, and he has caught just 51.3 percent of his targets this season (40 receptions on 78 targets). Look for Sanders to be utilized against Moore. 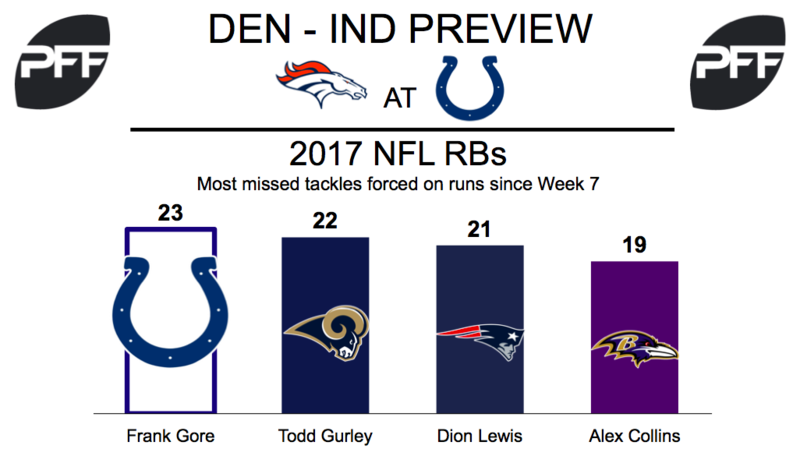 RB Frank Gore vs. Broncos run defense – Gore flourished in snowy conditions last week in Buffalo, earning an 84.7 overall grade. This was the sixth-highest mark among running backs in Week 14. He forced nine missed tackles, leading to a 58.1 elusive rating for the week. The veteran back has yet to slow down in his 13th NFL season, even with his 58.6 yards per game being the lowest average since his rookie year. Since Week 7, no running back has forced more missed tackles on rushes than Gore’s 23. Miami Dolphins’ Kenyan Drake torched the Broncos run defense in Week 13, but Denver improved last week against the Jets, allowing just 59 yards rushing. Shelby Harris’ 82.7 run-defense grade is the highest on the Broncos’ defensive line, but his 6.9 run-stop percentage is average at best. LB Brandon Marshall will also be a key cog in this phase of the game, as the linebacker has accumulated 11 stops over his last four games. T Anthony Castonzo vs. Edge Shane Ray – The Colts’ left tackle had himself a solid showing in last week’s loss to the Bills and has landed himself a spot on Sam Monson’s Top 25 linemen this season. In 27 pass-block snaps against Buffalo, the veteran allowed just one hurry. His 95.3 pass-blocking efficiency rating currently ranks 23rd among tackles. This Thursday night, Castonzo’s main combatant will be former first-round selection Shane Ray, who has been inconsistent since returning from wrist surgery. However, he has accumulated multiple pressures in four of his seven games in 2017. The edge defender has amassed one sack and 14 total pressures on the year. TE Jack Doyle vs. Broncos safeties – Last week, Doyle hauled in the Colts’ only touchdown in blizzard-like conditions, but he was only targeted on two other pass attempts. On the season, Doyle has earned a 74.1 overall grade (13th ranked) and has the third-most yards after the catch (277) at his position. The tight end is also averaging 1.55 yards per route run on 83 targets. Broncos safety Justin Simmons suffered a high ankle sprain in Week 14 and is listed as day-to-day. If Simmons is healthy, he will be Doyle’s primary matchup in the passing game. The second-year safety has an 80.2 overall grade in 2017 and is allowing 0.84 yards per coverage snap. If he is unable to suit up on Thursday, Doyle’s primary matchup would likely come against Will Parks, who has allowed five catches on eight targets for 37 yards and two touchdowns against tight ends since Week 8.